Samantha Smith (1972-1985) was known as “America’s young ambassador for goodwill” for bridging the two sides of the Cold War through her 1982 letter to then-Soviet leader Yuri Andropov (1914-1984) where she asked him whether his country would launch a nuclear war, his April 1983 reply assuring her that the country would not and inviting her to come to the Soviet Union to “see for [herself that] in the Soviet Union, everyone is for peace and friendship among peoples,” which she and her family accepted and undertook in July 1983. This post is the second in a series of retrospectives, which will run until August 2015, the 30th anniversary of her death, along with her father Arthur and six others, in a plane crash in August 1985. The real important thing is to make Samantha’s life valuable by moving on to this new step. And most of all, it’s a way for me to keep in touch with both of them. – Jane Smith (Picture Week, September 30, 1985). The Samantha Smith Foundation was established five months after Samantha and her father died in a plane crash in August 1985. Setting up shop in Hallowell, Maine, it initially utilized donations from people touched by Samantha’s story and funds from sources like the Rockefeller Family Fund, the Charles Revson Foundation (Source), the United States Information Agency, among others. By 1989, the foundation had been renamed to the Samantha Smith Center. 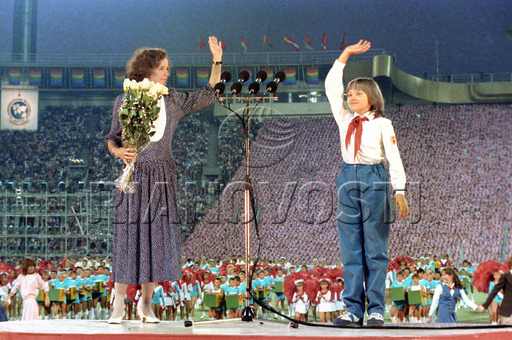 In July 1986, it sponsored the trip to the Soviet Union of Samantha’s friends and classmates in time for the Goodwill Games (video 1 in Russian/ longer video 2). The following year, it sponsored Soviet children in a two-week visit to the United States (documented in the October/November 1987 issue of the Foundation’s Samagram). In summer 1989, the now-Center sponsored 52 Americans to the Soviet Union and 56 Soviets to Maine in the United States; in summer 1990, 100 Americans and 200 Soviets, including those affected by Chernobyl in 1986. (The Newsletters section of the SamanthaSmith.info archives include pictures, stories, and testimonials by youth delegates from both sides.) The Center partnered with various camps throughout the United States to accommodate Soviet delegates, while American delegates were hosted mainly in Artek (but in 1990, other hosts included Orlyonok and the Bolshoi Camp). In 1991, the Center began a Job Shadow Program, aimed at immersing mostly Russian citizens with the free market by bringing them to Maine and assigning them to mentors in different businesses for four to six weeks. That year, the Center organized a business delegation that studied the possibility of expanding the program and visited Moscow. The program continued in 1992 and 1993. Jane Smith, Samantha’s mother, chaired the foundation and worked on it full-time at the height of its operations. Among others, the board of directors included Maine politicians Severin Beliveau and James Tierney, first women’s Olympic marathon runner champion Joan Benoit Samuelson (whose blueberry jam named “Joanie’s Jam for Sam” served as one of the foundation’s fundraisers), publisher Margarett “Peggy” Pusch, and camp director Jean McMullan. The WorldPeace camp had a separate board, but some of its members were also part of the Center’s board. The foundation also had an advisory board composed of, among others, television producer Al Burton (Charles in Charge), philanthropist Laura Chasin, psychologist Matina Horner, actor Robert Wagner and his third wife, actress Jill St. John, political scientist Robert Legvold, astronomer Carl Sagan (yes, that Carl Sagan), and child psychologist Lee Salk (who wrote the introduction for Samantha’s book Journey to the Soviet Union). The advisory board eventually included some former members of the Center’s board. Additional reading: Jane Smith wrote in 1993 a message summing up the Center’s programs for its first eight years (1985-1993). ← What could have been had Samantha Smith lived?